Hi, this is Rich from Western Appliance. 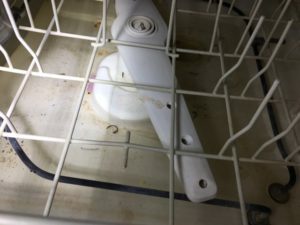 The picture below shows one of the dishwashers we serviced in Meridian. The customer complaint was that it wasn’t cleaning good and would not drain the dirty water. We pulled off the bottom panel to inspect the pump and solenoid. We found water leakage and extensive rust around wash motor. This repair would require a new dishwasher motor and sump which would make this impractical to repair, considering the age – 17 years old. The dishwasher would also require extensive cleaning. When considering the repair cost and age if dishwasher it would be best to replace this.